Today’s the Big Day, Royal watchers! By the time you read this, Prince William of Wales and Catherine Middleton will be united in marriage—and I bet the ceremony was lovely. I haven’t seen it yet: I promised Kid #1 I wouldn’t watch it on the DVR until she gets home from school. It’s taking all of my self-control to wait. Seriously! I’m an Anglophile, I’m a romantic, and I loved Princess Diana. 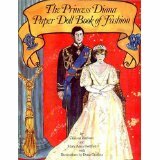 As a kid, I used my own money to buy this book of Princess Diana paper dolls. When Diana married Prince Charles, I was in elementary school and lacked a VCR. My mother, bless her heart, set her alarm clock for 2 AM so we could view the wedding. It was like watching Cinderella get married, but better, because the bride was a real person. The twenty-five foot train of Diana’s meringue-sweet gown swept the aisle of St. Paul’s and stirred my dreams of future romance. When I planned my own wedding, I no longer desired a poufy gown like Diana’s, but I did want to follow all of the traditions. White gown. Pretty flowers. Bridesmaids dressed in the cheapest matching frocks my friends could stomach. None of those traditions are Biblical, of course, but I honestly had no idea where they originated. Many of our customs—carrying flowers, bridesmaids wearing matching gowns, throwing rice—derive from acts which once served specific functions or represented something to pagan cultures. For instance, European brides of centuries past went to great lengths to ensure that their weddings were not hindered by evil spirits. 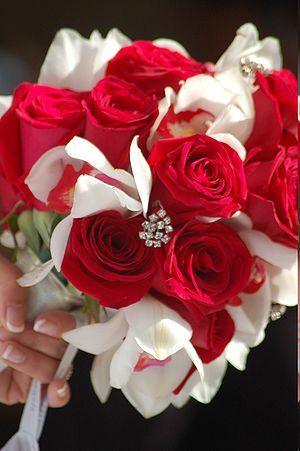 Bridal bouquets were composed of herbs and flowers which were thought to keep evil spirits at bay. Much like the concept behind carving pumpkins on Halloween, bridesmaids also attempted to confuse the spiritual realm by wearing matching clothes or dresses similar to the bride’s. If demons wanted to bother the bride, they’d have a harder time identifying her if she had lookalikes. Most brides today wear white, a Biblical and modern symbol of purity. But it’s hardly an old custom. Queen Victoria set the fashion in motion, although nineteenth century brides often wore their best dresses, regardless of hue. The Victorian era was also the birth of the "something old, something new" rhyme as well as other good luck/bad luck customs, like not marrying a man whose surname starts with the same letter as your own. Throwing rice and eating wedding cake are far older traditions. While weddings have long been celebrated with feasts (Jesus performed His first miracle at the wedding in Cana), wedding cake seems to have been an Ancient Roman fertility custom. Guests supposedly gathered the crumbs as good luck charms. During a Christian wedding, it’s customary—and appropriate—to pray for the happy couple. We pray for blessing, for children if it’s God’s will, and for unity. All too often, however, our prayers stop at the end of the service, lasting no longer than the shower of rice (or birdseed) that rains down on them as they hop into the limo. Our prayers for the couple shouldn’t be a tradition that stops at the end of the ceremony. The wedding of Prince Charles and Princess Diana reminds me of that. For all of the expense and pomp of their wedding, the marriage did not last. I’m not judging them; I was not in their marriage. Dealing with infidelity and heartbreak under a public microscope cannot have been easy to endure. I do not know what I would have done in Diana's place. But I can’t help wondering if marriages, unglamorous workhorses, sometimes receive less investment and dreaming than weddings. My husband is my best friend. He deserves a wife who invests in her relationship with him. Talking. Praying. Respecting. Reading books and attending retreats to help us nurture our relationship. Arguing and then hugging it out, because neither of us is going anywhere. So today, I wish Will and Kate well. I may even order their paper dolls. And while I snuggle down with my daughter this afternoon to watch the recording of their (sure to be spectacular) wedding, I’ll enjoy the hats and hoopla, but I’ll also say a prayer that they enjoy a fruitful marriage, with God at its center. I don’t know if God was invited to their wedding as their Guest and Lord, but praying for them can’t hurt. And it serves as a reminder to me, too. Prayer—for our spouse, and for one another—is a marriage tradition worth preserving. Did you watch the wedding this morning? If so, what was your favorite part--the hats, the people watching, the dresses? Susanne Dietze has written love stories set in the nineteenth century since she was in high school, casting her friends in the starring roles. Today, she writes in the hope that her historical romances will encourage and entertain others to the glory of God. Married to a pastor and the mom of two, Susanne loves fancy-schmancy tea parties, travel, and spending time with family and friends. Her work has finaled in the 2010 Genesis Contest, the 2009 Gotcha! Contest, and the Touched By Love Contest, 2008 and 2009. You can visit her on her personal blog, Tea and a Good Book, http://www.susannedietze.blogspot.com/. I haven't seen the wedding yet. But I'm about to try to catch a few snippets on the morning news. I shall be back with commentary later, I'm sure! I only watched a snippet of them walking out to the carriage, but the dress was divine, and the cathedral was exquisite. I woke up at 5:30 and tried to go back to sleep. My husband decided to get up at 5:45 (thus waking me up again). And then son #1 came downstairs a couple minutes later. Hadn't intended to watch the wedding, but since we were all up anyway, I had hubby hook up the TV. Oh, and I'd never heard the one about not marrying a guy with a surname that starts with the same letter. That one would have to be recent since formal surnames haven't existed that long. Guess no one told my mother's cousin that bit of tradition. Her maiden name was Williams, which is a pretty common name in central PA where a lot of Welsh people settled. Her first husband's surname was Williams, making her a Williams Williams. He died and she later remarried. Her second husband's surname was ... yep. Good morning! Happy Wedding Day! Oh, it is taking all of my self-control not to turn on the TV. But it's not even 6 AM at my house, so I'm going to wait till the kids get up so we can at least see a snippet with the dress. Lisa, do come back with commentary! I'd love to hear everyone's opinions on the dress and pageantry and the kiss on the balcony! Dina, the dress was divine?! Oh, I can't wait to see it. I expected nothing less than elegance from this gown. I heard that all of the flowers and greens used will have symbolic significance, and "they" were placing trees--two hornbeams and four or six of something else--along the center aisle of the cathedral. I am curious to see what it looks like. Good morning, CJ! I woke up around 4 for no reason, myself (well, that's not quite true. I've got a stuffy nose.) Anyhoo, I didn't want to wake up my husband so I tried to go back to sleep. No such luck. And the TV is still OFF, ladies. Wake up, Kid #1, wake up!!! CJ, I was surprised by all of the Victorian-era good luck/bad luck customs I found when I did research. Don't wear pearls because they represent all of the tears you'll shed through your marriage. Don't sew your own dress or you'll be "sowing" in your own tears. Lots of tears-related sayings! I found 2 customs relating to rain--it's either good luck because all your crying will be done for you, or bad luck because the rain represents your tears. The surname thing is another odd one. I really don't know why it's considered bad luck, per se. The story of your mom's cousin is a hoot. I've heard that Christian singer Steven Curtis Chapman's wife was also named Chapman, and that's how they met. Oh, I heard the official wedding cake (because there's something like twenty cakes) is a "traditional English fruitcake," chock full of dried cherries and raisins. Has anyone seen a photo of that yet? Any guesses as to how it tastes? Very fun. I think you should get those paper dolls. About the cake, Susanne, I'd guess it tastes more like a sweet bread here. Took me a while to get used to British "cake." Eventually we figured out if we wanted real cake, we had to ask for "gateau," which is the French word for cake. Now the French know how to do pastry properly. The dress was divine. Epitome of elegance. It reminded me of something from the 50's. Grace Kelly could have worn it. Kate looked stunning. Very regal. The kiss on the balcony was super quick, just a peck really. I guess Will isn't much of a fan of PDA. Cheryl, I *will* get those paper dolls! But I may wait until there's a book available with her wedding gown in it. I love paper dolls. But that's another post. Thanks for coming by! Did you watch the wedding? Mmm, sweet bread. Thanks for the clarification, Dina. I'm certain the cake will be (was?) scrumptious. Although I'll be sure to order gateau when I ever get over there. One of the foods requested by William (for one of the two official receptions) was shepherd's pie, which made me cheer. I love shepherd's pie. Anything topped with mashers is awesome by me. I saw a 3-minute recap of the wedding! Oh wow, that dress. Gorgeous. Stunning. Regal. She looked beautiful. A friend of mine posted on FB that Kate's brother read from Romans during the service. How awesome that God's Word was declared to several million people today! Yes, Kate's brother's reading of the scriptures was elegant. It was a very Christ-centered wedding. Lovely. The dress was stunning, gorgeous, and I could see the emotion on Kate's face through the veil. She's very beautiful and poised. I loved the shamrocks on William's collar. I didn't get to see the cake. Susie, I think it's lovely that your mom made those memories for you and that you're doing the same for your daughter. Hi Suzie! Thanks for the sweet words. I am blessed that my mom is visiting right now, so we ladies can all watch the wedding together! Oh, I will be on the lookout for those shamrocks. I love the details. I remember when Prince Andrew married Fergie, her gown had thistles and bees embroidered on the train, and I thought it was lovely. Susie, that your mom is here to watch with you and you daughter makes it even more special. Have fun this afternoon! Thanks, Suzie! Everybody's home now, so I'm heading off to the couch! I'd say enjoy, but I don't need to because I know you will. Then come back and tell us what you thought. Little Lady Louise is precious and so were the little boys who sang. I watched with friends this morning and it was so fun; hats, tiaras and the best teapots and cups for all! We commented on how it was all so magical and I guess that's because you could put on just as elaborate a celebration here in the US, but it would be 'make believe', William is real royalty and there is nothing quite like that. We only see this kind of pageantry a few times in a lifetime, it is a unique and rare experience. Hope you and Hanna have a great time sharing this stylish, classic wedding. I set my alarm and got the fixings out the night before to bake scones while I waited for the arrival at church. Guess what - A tree took down a transformer and I lost power at 12:30...it didn't come back until 7:45. I was so disappointed. But I just finished watching much of it on ABC video and I was teary and had goosebumps. Wow. Thanks for the fun look at traditions and for sharing my obsession about this wedding, Susie! I will be watching all I can on it tonight as well. Truly a fairy tale but so real as well. It doesn't hurt that William and Kate are story book beautiful as well! Wow, I didn't know most of that stuff about the traditions of weddings! Saw a snippet of the Royal Wedding, and I absolutely loved Kate's dress. Very beautiful. Suzie, Lady Louise is adorable. So is Tiggy's little boy! Precious. I loved the boys' choir. They sounded beautiful and were all so rosy-cheeked and sweet. Lovely service. There were some wonderful points in the homily, too. I liked the prayer that Will and Kate composed. Oh Gail, your tea party sounds like so much fun! Alas, when I watched, I wore my royal yoga pants. But I did have tea. I think you're right; there's something about a "true" royal wedding that can't be imitated. Which reminds me, I loved how the Bishop of London started the homily: every wedding is a royal wedding because we're in the service of The King. I miss you, Gail! Thanks for coming by! Oh Suzie, I did see the shamrocks on Will's collar! It really was a beautiful service. I prayed for them and remembered my own wedding and got all mushy. Kate and William are quite good looking, you're right! Hi Faye! I loved Kate's gown, too. It really did remind me of Grace Kelly's--elegant, sophisticated, and lovely. Some of our wedding customs are pretty interesting, aren't they? I wonder why the bridesmaids follow the bride in England, but in the US they precede the bride. After the wedding, Kate's bouquet will be laid on the tomb of the unknown soldier. That tradition goes back at least to the Queen Mother. Thanks for coming by, Faye! Enjoy the weddings recaps. ABC's coverage on Friday night was interesting. I loved the portion set in WALES! The local mayor in Anglesy admitted they consider William a 'foreigner' but they like him anyway. Prince of Wales he may be some day, but he's still and Englishman to them! That said... if they produce a son in the next two years, the Welsh might just allow this one to be a real 'Prince of Wales' some day. There's talk that the law may change and not force the oldest male to be next heir but the oldest --male or female. Another fun point is that the tiara Kate wore was borrowed from Q.E. and she got it from her mother...who received it from her hubby, King George of 'The King's Speech'. Oh Deb, I missed the ABC show last night! I would've loved to see all of the Wales coverage. Last night, we watched Wall-E. Make of that what you will. So do you think they'll have a baby soon? (Kate and Will, of course, not Wall-E and Eve.) Or will they wait until Will's military service is up? The Queen Mum's tiara was just perfect. As elegant as her gown. I put the tv on this AM while doing dishes and cleaning and NAt GEO had on an hour long special on the last century of royal weddings. I was sucked right in, but it was very nice. Saw a lot of the same carriages! There's been a lot of divorces, too! I watched it tonight with the boys after the power came back on. We watched the long CBC version. JJ said he loved that it was history. Nick loved Peter's view on the fascinators. Both boys agreed with me that Eugenie's hat looked like antlers. Talk about a fashion statement gone wrong. I'm craving to do a blog on the hatwear alone. The wedding was perfect and satisfying. They are so in love. And Nelson got a kick whenever Will's thumb rubbed her hand - especially in the carriage as they came out from under the arch. Sigh. It was so romantic. Oh, and the shoes hanging from the Austin Martin - perfect! I agree Anita. I loved it and I'm still watching any review show I catch. A "good" emotional memory rather than a sad one for a change. I'm still watching the shows, too, Anita and Deb. Yesterday I received my Time Magazine with Will and Kate on the cover. It's a lovely distraction from other, more emotionally charged events. I have a feeling we'll be talking about this wedding for a long time. Welcome Whitaker House Author Penny Zeller! Free resort reservations for you, today!